Following her recent grounding on Sanda, just off the southern end of the Kintyre peninsula, FINGAL has spent the last few days in the confines of Troon Harbour discharging her cargo of logs. While there, she was given an inspection by the MCA, which revealed six deficiencies. These included her echo sounder, her radar, and her magnetic compass. From the Paris MoU website, she does not appear to have been detained at this time. 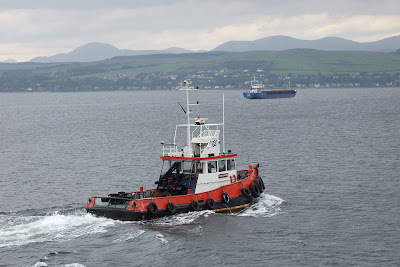 However, on Thursday FINGAL was permitted to sail from Troon to Greenock, where she is now awaiting a berth in the Garvel Drydock, for full underwater examination. As seen here, she was accompanied for the passage by the Troon-based tug RED COUNTESS.